If you knew me before I got married, it would be very clear by my maiden name my background is largely Italian, mixed in with some Polish and Czechoslovakian. St. Patrick's Day has never been a huge holiday to me. I'm not against it, per se. If my friends have a party, I'll go and enjoy. If I'm feeling festive, I might slap some green on. But, overall, it's kind of a non-event in our household (Hubby is proudly Scottish, among other things). But today, St. Patrick gazed upon this Italian girl, and I some how fell into his good graces. Because this morning, Hubby and I took the girls to a nearby park for some running around outside time. It started off like any other park date, but at one point, something compelled me to look down at the grass. COMPELLED, I tell you. It's like a voice urged me, "Hey! Check this out!" A FOR REALZ four leaf clover. On March 17th! I'd spent the better part of my childhood combing my yard (and other people's yards, for that matter) in search of the elusive (and legendary) plant. Never had I come across it. 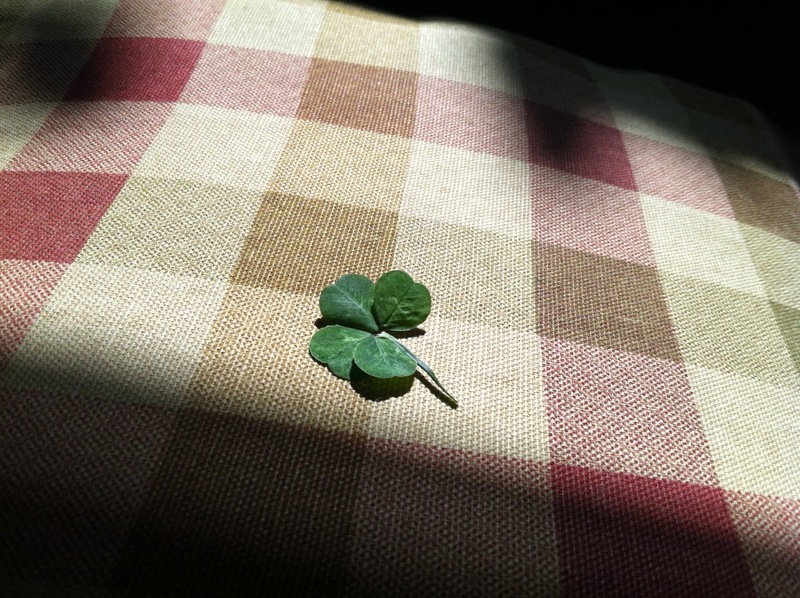 And yet, on St. Patrick's Day nonetheless, I found my lucky charm. That has to be, like, Luck to the tenth degree, right? I don't know why St. Pat decided to shine his favor upon me on his special day, but I'm not going to look a gift horse in the mouth, amiright? Whether you are Irish or not, and whether you like celebrating holidays or not, I hope you have a fun and festive St. Patrick's Day. Me? I'll be waiting for my call from Publishers Clearing House. I know right? YAY SPA DAY! Holy crap...or lucky, I should say...really?! Go get some lotto tickets NOW!